In present day Cameroon, women are still regarded as subordinate to men in almost all aspects of daily life, especially in the rural villages. National law in Cameroon is not particularly unfair to women, but traditional law is still practiced in most areas which favours men. We have found land rights to be a major issue in numerous villages and we have chosen to address this issue in the beginning stages of the project, but we will also address others as we expand and develop the project. 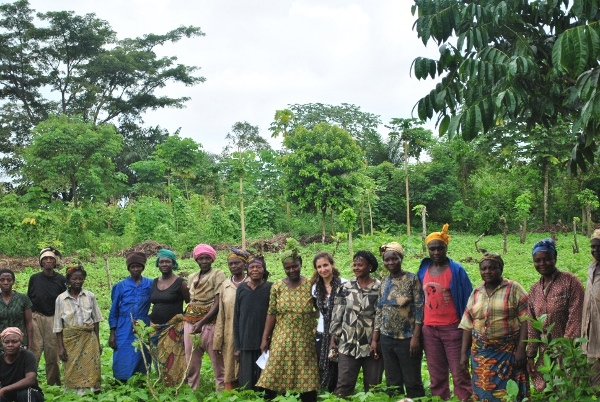 In fact, despite women being responsible for the majority of food security, household management and agricultural production in Cameroon, they control very little of the land. The current legislation guarantees equal rights for both women and men to buy, own, use, inherit and dispose of land. However, traditional law in rural areas is still biased against women - as wives, widows, sisters, daughters, divorced and separated women - limiting their ability to have secure access to land. In most rural areas, where customary practices prevail, land is owned and controlled by the men; even when they migrate into the city or die, control is given to a relative/friend or inherited by the heir. In both situations, the land is entrusted to a male. Although such lands may be at the disposal of the female for small-scale agriculture, its management cannot entirely be in her hands. Most women are able to rent land, but the uncertainty of their access limit their choice of crop to seasonal ones that grow quickly which lessens yields and revenue. This lack of control means that they do not have access or control to the proceeds of agricultural production. If women controlled their land they would have the power to make decisions on the type of investments on land and its proceeds which can lead to overall poverty reduction and ensure community livelihood. We adapted the Rural Participatory Appraisal method to the specific context to gather information from rural communities around Buea. 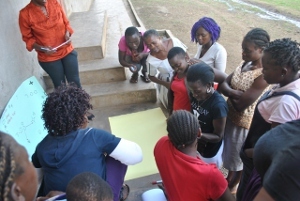 We have held focus groups to gather community specific information from vulnerable women (i.e. widows, single mothers) as well as community leaders. We also did a mapping activity to identify key locations in the community and their relationship between each other (mutually beneficial, one-way relationship). We have also held in depth interviews with individuals who had a special case or specific knowledge in land rights issues. Finally we engaged in participatory observation to analyze the relationships of diverse community members and the position women hold as well as their role in their community. Enhancing women's rights and supporting their access to land in rural villages of Fako District. We are starting with 3 villages - Tole, Ekona and Bwatingi - to set up the project and ensure our strategies are appropriate and effective in the context. We will determine what practices work best and then use a network approach to expand to other villages. We will bring women from villages where the project is established to new villages to share their experiences and knowledge with the new community. Rural women are organized in networks and are aware on their rights and entitlements. Community members understand and comply with legal framework regarding women access to the land. Women land titling registration property increased. Liaise with other organizations and institutions that work with gender issues in Buea. Advocating to bring about policy and practice changes with regards to land management and allocation, gender based violence, women's access to justice, etc.